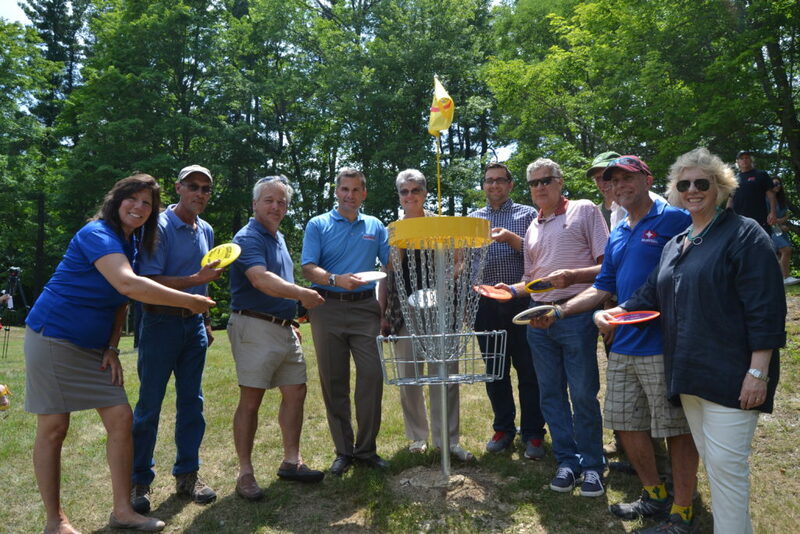 Poughkeepsie…Dutchess County Executive Marcus J. Molinaro and the Dutchess County Parks Division today celebrated the grand opening of Dutchess County’s new disc golf course at Wilcox Memorial Park, located in the Town of Milan. The course is open to the public seven days a week during park hours. Use of the course is free with discs available for rent or bring your own. The course opens with nine holes ready to play and will expand to a full 18-hole course in the fall. “Disc golf incorporates nature and skill all-in-one. Matching physical with mental fitness, players of all skill levels are invited to one of our great County parks to enjoy and compete. This is yet another fun way for people to be active and help us achieve our goal of being the healthiest county in New York State. This great new course at our beautiful Wilcox Park is one more attraction that makes us ‘Distinctly Dutchess,’” said County Executive Molinaro. Disc golf, similar in rules, terminology, and strategy to the traditional game of golf, utilizes hi-tech flying plastic discs and elevated metal baskets. Instead of a ball and clubs, players typically carry a bag with various discs suitable for drives, approach shots, and putting. Each player takes turns throwing a golf disc from a tee area to a basket, taking each consecutive throw from the spot where the previous throw landed. The player with the fewest throws wins. A typical 18-hole round can take up to two hours to play or as little as one hour. The disc golf course at Wilcox Memorial Park was designed by Dan Doyle, a seasoned course designer and disc golf competitor and promoter. Mr. Doyle has designed and co-designed numerous courses throughout the northeast, including the widely acclaimed Brakewell Steel/Town of Warwick Disc Golf Course which has hosted several national-caliber professional disc golf tournaments. The course design takes advantage of Wilcox Park’s natural landscape, with rolling topography, woodlands, meadows and scenic vistas. Trees, hills and terrain provide challenges for players. The course features blue championship tees, as well as more beginner-friendly red tees on a majority of the holes, allowing for players of all skill levels to enjoy the game. “Disc golf is quickly growing in popularity and we are very pleased to offer our new disc golf course as a unique amenity for residents and visitors. We encourage everyone to come check out the new course and make use of many of the offerings at Wilcox,” said Dutchess County Parks Director Steve Olsen. Wilcox Memorial Park is a 615-acre park located in the northern portion of Dutchess County on Route 199 in the Town of Milan, overlooking Stissing Mountain and the Catskills. Visitors can enjoy a wide variety of offerings including fishing, paddle or row boating, a swimming lake and sand beach, camping, over five miles of hiking trails, bird watching and pavilion rentals. During the winter, visitors can enjoy cross-country skiing. Recent improvements at Wilcox have included two new playgrounds, a basketball court, and a maintenance building. Wilcox Memorial Park is open from 9 a.m. to 7 p.m. Monday to Friday and 9 a.m. to 8 p.m. on Saturdays and Sundays, now through Labor Day. 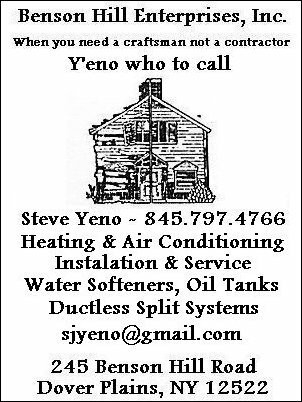 There is a $5 per carload park entry free for Dutchess County residents and $10 per carload entry fee for non-county residents. Three-disc sets are available for rent for $5 or you can provide your own free of charge. 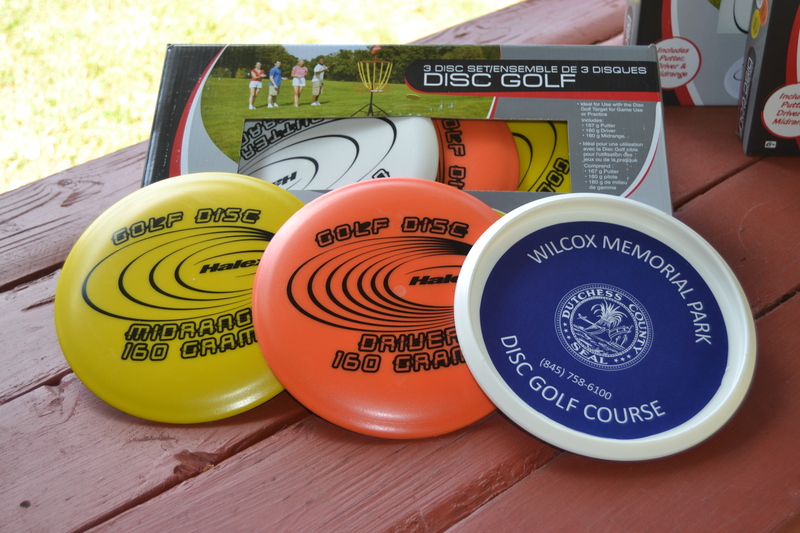 Disc sets are available for purchase for $24.95 and are available at the Wilcox Memorial Park office or boathouse. To learn more about Wilcox Memorial Park and all of Dutchess County’s parks, visit dutchessny.gov or call the Dutchess County Parks Division at (845) 298-4600. To learn more about disc golf, visit: http://www.pdga.com/introduction.